Please arrange a time and date with the Vicar .There is no charge for group visits. the High Altar to the east of the Church. The organ dates from 1873, it was a gift of Henry Crawshay, Ironmaster of Merthyr. The Bells of Santiago have now been returned, as a gift, to Chile, but we still have a memorial bell on display in the south aisle to commemorate the devastating fire in Santiago's Jesuit Church and the story of how its soot blackened bells found their way to All Saints Church in the nineteenth century. 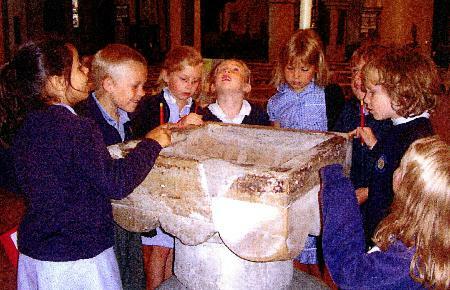 For more details have a look at our Tour of All Saints pages. In 2011 we invited 250 Primary School children to a Schools Proms concert given by the James Davies Brass Group with organ and percussion. Both the 2012 and 2011 events were sponsored by the Austin Bailey Foundation. "I saw the pulpit, we sketched objects. I saw the big font and organ. We had to be quiet. I saw the huge organ. Thank you Bill. I had good time. Jack"
"We went to All Saints Church on Tuesday. We met Bill. I am writing, so is Josie. Thank you Bill. I had a good time. Thank you very, very much"
"We went to All Saints Church. I was looking at the huge font. It was made out of stone. I like the font. I had a good time. Lydia. "We met Bill the Verger. He answered all our questions. Me and Nia were standing in the Lady Chapel. Thank you Bill. I had a good time. Charlotte." "I looked around the church. The girls sang a song. Thank you Bill. I had a good time. Luke"